Since the time of the pyramids, concrete masonry products have proven to be versatile, durable, and easy to install. Strong, economical and aesthetically pleasing; concrete masonry is recognized worldwide as the ideal building material. “Concrete Masonry” includes all concrete products such as concrete block, concrete brick, and concrete architectural units such as scored block, split-face and split-fluted units. Our equipment can produce all of these units in a variety of sizes, shapes, colors and configurations. Our highly economical systems make a minimum use of cement due to our implementation of unique features such as special vibration systems. Many of our models are also specially suited for the manufacture of products in vary large quantities, and all our equipment can produce top-of-the-line concrete masonry units. The predecessor of the modern Paving Stone (or Concrete Pavers) where the cobblestones of ancient Roman roads. These versatile concrete products are used in settings such as parking areas, pools, container loading ports, pedestrian walkways, and factories. Pavers are a sound, and beautifying alternative to plain stamped/embossed concrete or asphalt and can be manufactured in hundreds of shapes, sizes and colors. Our equipment’s versatility coupled with innovative and unique features allow our machinery to economically manufacture high strength, aesthetically pleasing concrete pavers in large volumes and multiple designs. No matter what paver shape or size, whether interlocking or not, whether permeable or not, we can help your company manufacture it. Landscape products are used for the beautification of public and private areas around the world. Everything from small gardens, to large public spaces, shopping centers, industrial company grounds, parks, courtyards, commercial businesses, entrances, atriums, and theme parks are all perfect for landscape units. Here again, our equipment proves its flexibility by allowing for the manufacture of these products in hundreds of shapes, forms and colors. Our specialty and auxiliary equipment such as tumblers, grinders, splitters, shot blasters and antiquing units provide extra textures for the discriminating landscaper. TIGER covers all of your landscape product needs. A new term in our industry, hardscape products refers to the great many types of heavy duty and structural concrete products used for the beautification of public or private areas such as at shopping centers, industrial areas, parks, commercial businesses and even highways. These products add to the natural or urban beauty of any location with their unique and innovative shapes, split-face designs and staggering array of colors. Our cost-effective equipment can manufacture high-quality hardscape units that allow you to take advantage of the huge world-wide demand for variety and quality that has made this one of the fastest growing segments of the market. Whatever your needs may be for hardscape products, TIGER has the solution. Environmental Products in our industry refers to a broad selection of hardscape/landscape products, as well as structural and barrier products, specially designed to have a positive impact on the environment. 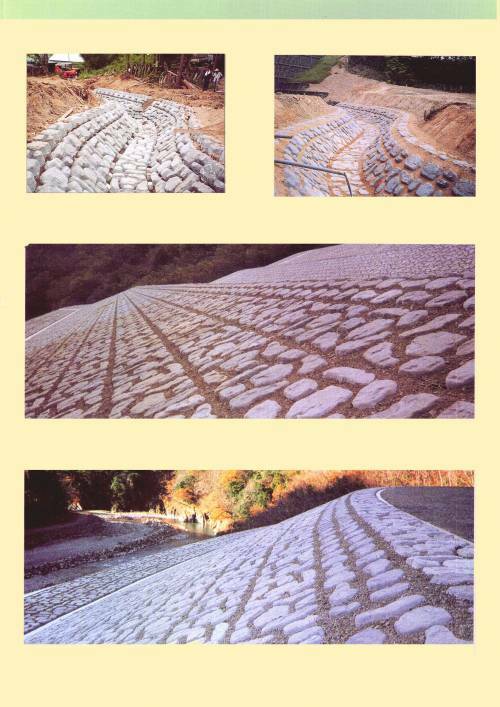 They do this by minimizing soil and turf erosion, protecting river embankments, line channels, cover irrigation or drainage ditches, and protect beaches from sand erosion. Many environmental products are also manufactured under exacting engineering standards for specific applications. They can be beautifying as well as functional, or become invisible with time as they are covered with grass or other vegetation growth. Most of our equipment can manufacture high-quality hardscape units in multiple designs. Today’s concrete products markets demand more from suppliers of building materials. There are thousands of products and potential products that fit into this group. From non load-bearing units, to specialty architectural and decorative units; veneers and other types of masonry such as cored and non-cored specialty bricks, to interlocking bricks and stone-like facade covering slabs, roof cap block, optical effect units, drainage tile and block, and marker units – TIGER can produce them. We are only limited by the imagination of the designer or architect, and the structural application. We are ready to work with you to select and economically manufacture the products that you require to satisfy your customers.